Last Friday, our office Internet was sporadic. You all know that adventure. It will randomly cut out at weird intervals, usually when you haven't saved about 30 minutes worth of work. Jon showed me how to reset everything once it goes out. After the 3rd resent in 2 hours, it took longer to come back up than usual. I decided this was a good time to clean out some boxes. Now, we use a lot of paper in the office, currently. We have a major project with 18 machines and the client wants all the data printed and shipped. 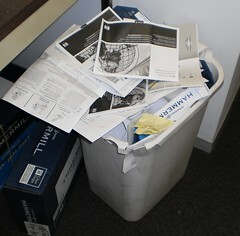 Fortunately, they only want one report but a week's worth of data times 18 machines is a lot of sheets of paper. It means we go through toner on the average, right now, of one cartridge a month. The copier needs to be changed about once every 3 months. Every box of toner comes with a recycling label. You just slap the label on the outside of the box and put it out for UPS. The guys don't do that. Mike even said they were "lazy". They stuck the used toner cartridge in a box and put the box in a pile across from the printer and left them there. And so the boxes piled up. On Friday, I decided, when the Internet was taking its sweet time to restart, I should deal with these. You can see how many there were. There are three more that have to go back to Office Depot the next time we need supplies because I didn't have a label for them. What I should do, if we don't have a run for supplies planned soon and a toner gets used up, stick the three without labels in a larger box and ship the whole thing back. When I started working here, we didn't recycle. My boss wasn't interested in that, poo-poo'd it, in fact. I bought a trash can and set it between our offices. I made sure to use it. We don't have a building-wide recycling opportunity so I take it home with me and add it to my can. I used to put this container out for the recycling but then we got the big blue rolling containers. It's time to empty this one so I'll take it home tonight and dump it in my can. I would say we've gone from recycling 5% of our paper waste to 90%. The guys across the hall use an old paper box which makes it easy to transport. We also recycle batteries, plastics and cans. That's less productive, about 75% gets recycled. I have a smaller bin in my office for plastics and cans. Batteries have their own spot and we need to do a battery run. I'm rather proud of my efforts to get recycling in the office. It took a bit to get the cleaning service trained. They kept emptying the recycling bins and putting garbage bags in them. For a month, I had to leave increasingly more strongly worded notes about not emptying the bins. It's probably tough because they are trained to clean and clear and I'm telling them not to. Recycling is so much a part of our mind set now. We had stacks of cardboard from boxes we cut down and one of the guys finally loaded it into his car and took it to a large recycling facility where you can just dump off cardboard of any size. To fit in my can, we had to cut things down to 3 by 3 feet square and that's just not going to get done when we're busy. 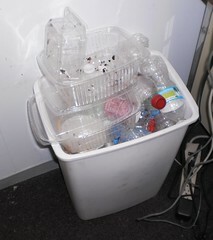 I don't know if other offices in my company recycle. I know one doesn't. We sent someone to help them when they were busy. He asked, "Where is your recycling bin?" after finishing a soda. They looked at him and laughed. I like to think that at least here, we're doing our part to make every day Earth Day.